NIA-CHARLESTOWN NEVIS (June 10, 2011) — General Manager of the Nevis Electricity Company Ltd. Mr. Cartwright Farrell said at a press conference on Tuesday, that Nevis had a unique opportunity to develop a natural resource many in the region wished they had. He said several conversations with counterparts in other parts of the Caribbean led him to that conclusion. The press conference which was held at the Ministry of Finance Conference Room in Charlestown with local press, served as the Nevis Island Administration’s (NIA) launching pad for a week of activities geared toward greater public awareness for geothermal development on island and its many benefits for the people of Nevis. “Nevis has led the way with the development of geothermal energy and advanced to a further stage than any of the islands that sought to develop it in the past. Nevis’ success for the development of geothermal bears great significance not only for Nevis but also the rest of the region,” he said. However, Mr. Farrell underscored the importance of geothermal energy development to Nevis and described the natural resource as clean, renewable and safe. He stressed it was the only way forward for Nevis if the island wanted to become the energy sufficient and clean island that it could be. Regarding NEVLEC, he noted the development of geothermal was highly anticipated and was set to remove the fuel surcharge, reduce the need for expensive maintenance bills for mechanical wear and tear on engine parts, improve reliability and reduce pollution. 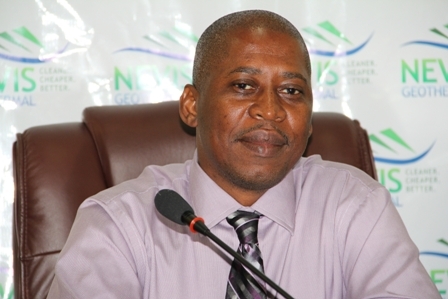 The Utility Company’s GM gave a synopsis of the cost of operations at the power plant and the importance of geothermal development to Nevis because due to the increasing world market price of oil. “Today for NEVLEC the cost of a 2.8MW diesel generator is around $1.5million. The cost of operation at today’s price of oil could be between $4million per annum. The [generator] will last for say 20 years, so the cost of the set over its lifetime is around $100 million and that is without taking the price volatility into consideration. “We consume over 240,000 imperial gallons of diesel per month to generate power for the island and at today’s price this costs just under $3million. This money is for totally imported fuel whose price is determined elsewhere. We as a small island have no influence on its price. Geothermal energy on the other hand is an indigenous power source, it is a natural resource of the island,” he explained. Mr. Farrell further added that the cost of the geothermal resource was not a variable on the stock market where the price could be determined. Therefore, the cost of electricity could at least remain stable which translated into better planning opportunities for residents and businesses on Nevis.